A wife and her husband were having a dinner party for all the major status figures in Rome, Italy. The wife was very excited about this and wanted everything to be perfect. 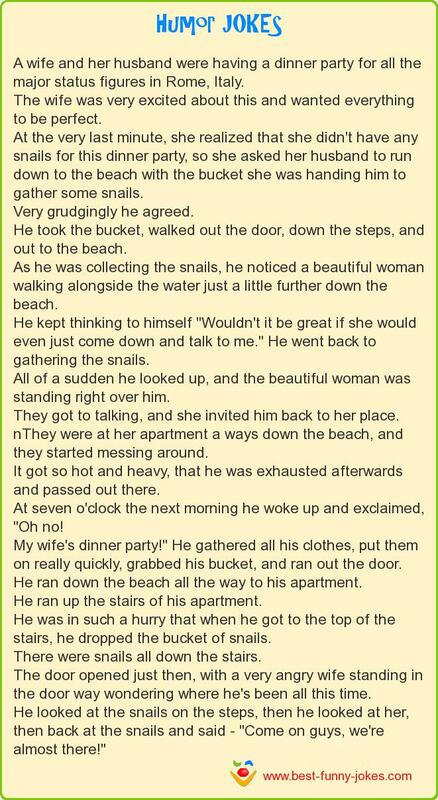 At the very last minute, she realized that she didn't have any snails for this dinner party, so she asked her husband to run down to the beach with the bucket she was handing him to gather some snails. He took the bucket, walked out the door, down the steps, and out to the beach. As he was collecting the snails, he noticed a beautiful woman walking alongside the water just a little further down the beach. He kept thinking to himself "Wouldn't it be great if she would even just come down and talk to me." He went back to gathering the snails. All of a sudden he looked up, and the beautiful woman was standing right over him. They got to talking, and she invited him back to her place. nThey were at her apartment a ways down the beach, and they started messing around. It got so hot and heavy, that he was exhausted afterwards and passed out there. At seven o'clock the next morning he woke up and exclaimed, "Oh no! My wife's dinner party!" He gathered all his clothes, put them on really quickly, grabbed his bucket, and ran out the door. He ran down the beach all the way to his apartment. He ran up the stairs of his apartment. He was in such a hurry that when he got to the top of the stairs, he dropped the bucket of snails. There were snails all down the stairs. The door opened just then, with a very angry wife standing in the door way wondering where he's been all this time. He looked at the snails on the steps, then he looked at her, then back at the snails and said - "Come on guys, we're almost there!"